Heading into the final day to comment on the Department of Labor’s efforts to enforce its new fiduciary rule on retirement planning, more than 400 letters from a range of different industry players are flowing into the regulator’s coffers. But a few common themes are already becoming apparent, say legal experts and wealth management analysts surveyed by FA-IQ. These include concern about a process some see as prohibitively expensive and too complicated to implement right away. Besides such operational concerns, several major broker-dealers are urging DOL regulators and SEC officials to work together. “A lot of firms are saying that the SEC is the regulatory body impacting the broadest cross-section of the industry, so they’re arguing that the DOL should coordinate any implementation changes with the SEC,” says Christopher Barnes, a financial services analyst at Cogent in Cambridge, Mass. Some big banks are pointing out that as many as 19 different regulatory bodies now oversee their operations, he notes. “A crosscurrent of dissent is whether the DOL should even be involved in this issue,” Barnes says. A case in point is a letter by Dennis Glass, chief executive at Lincoln National Corp. He calls for the DOL to “work with other financial services industry regulators” – including the SEC, Finra and state authorities – “to create a harmonized standard of care” and “uniform” enforcement policies. 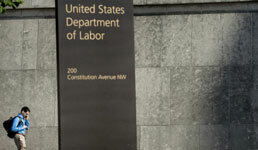 While a call to delay full implementation of the DOL rule’s early 2018 deadline is a common refrain, no consensus seems to be forming around the exact timing. Some firms are voicing support for a six-month delay while others would like to see a year’s delay. Several commentators are even seeking a delay tied to when the DOL actually comes to a final decision, which some letter writers complain still remains unclear. Along those lines, analyst Barnes notes the DOL’s initial commentary period’s Monday deadline seems to be “accelerated” from more typical governmental timeframes. Contrary to an earlier commentary period, this new round asks a series of more than a dozen different questions ranging from whether the rule is going to harm or help investors to how the best interest contract exemption might impact advisors. The BICE provision seeks to open avenues for brokers to earn commissions when working with retirement accounts by disclosing in writing to clients the implications of what’s being proposed. “This new period for comments is probably going to prove to be more indicative of the changes to take place in the BICE and other parts of the rule – the questions being asked now are fairly specific,” says Bonnie Treichel, chief compliance officer for independent RIA Multnomah Group in Portland, Ore. The attorney for the independent RIA, which manages about $16 billion, adds that the Trump administration now has its pick to head the DOL, Andrew Acosta, in place. “That should also help to make this comments period more substantive than past rounds,” Treichel says. The looming Monday deadline comes after the department asked this spring for comments about pushing back the start of implementation from April. Then on July 6 – less than a month after partial implementation began – the Federal Register published another request asking whether the rule should be delayed even longer and whether bigger changes need to be considered. Any apparent jockeying for position on fiduciary standards between regulators also seems to be sparking an outpouring of comments about the costs of full implementation, observes Marcia Wagner, an estate planning and Erisa attorney in Boston. The biggest push to keep the DOL rule “as is” appears to come from consumer advocacy groups and big unions, notes Cogent’s Barnes. At the same time, he points out several advisors running independent RIAs are also voicing strong anti-BICE sentiment. “I was a strong supporter in the early going – I’ve been acting as a fiduciary for my entire career,” says Gary Duell, an indie advisor in Happy Valley, Ore.